If you know its package name: type it in the menu, and click on the install button. If you don’t know its package name: use the Software Manager, Synaptic or the terminal. Most of the time though, you have a precise idea of what you want to install, but you don’t remember the exact package name, or it’s long and tedious to type. Ideally you’d like to install it without launching any tool, but the menu requires you to know the exact package name, or else it simply doesn’t find what you’re looking for. To solve this problem, we integrated APT into the menu and made it aware of the packages that are available on your system. So when you start typing, and the menu realizes what you’re looking for isn’t installed already, a list of packages matching what you’re typing appears in the list. Open the menu, start typing and filter through some of the 30,000+ packages that are available to you. Using the keyboard, this is really quick: Ctrl+Super, start typing, go up, press Enter.. and the package starts installing. By hovering the package names you can also see their summary and their description. There’s something about Web2 and its brands that shouldn’t really go beyond the scope of the browser and land on our desktops. It’s annoying, say, for a non-Facebook user to see Facebook appear on the desktop. There are many Web2 majors that offer useful services and which are used by a huge majority of us, but among them, two are particularly popular, to the point that they became reference tools in their own right: Google and Wikipedia. You probably often launch Firefox, just so you can Google or Wikipedia something… and so we found it handy to add these features to the menu. If you’re used to type on the keyboard and filter through your applications, you’ll soon get used to opening your menu and typing on your keyboard to install software, to Google or Wikipedia something, to search for files on your computer or to lookup something in the dictionary. We also added a little button, next to the search entry which pops up an extended search menu. From this menu you can find software, tutorials, hardware, ideas and even Linux Mint users. So, if you’re looking for a printer that is compatible with Mint 9, or you’ve got trouble setting up something on your Vaio laptop, just type “printer” or “sony vaio” and click on “Find Hardware”. If you’re looking for information on how to use the IRC, simply type “irc” and press “Find Tutorials”… The Community website is growing every day, with information written for and by Linux Mint users, and its ideas, users, hardware devices, software reviews and tutorials are now just a click away. The search is now multi-threaded, i.e. it happens in the background, with a slight delay so you can continue typing without experiencing lag. Search engines results appear immediately, APT results follow an instant later. You can now search for multiple keywords so it’s even easier to find the packages you’re looking for. For instance: “linux headers 2.6” or “gnome games”…etc. The annoying focus bugs in mintMenu are gone. The problem was found while debugging this feature. Whether it’s the context menu in the favorites, the trash popup in places, this new extended search menu or any popup menu used in mintMenu, the focus goes back and isn’t lost anymore. This fixes many bugs related to mintMenu, the menu not closing when the desktop is clicked, the search field not responding after using the popup menu..etc.. The sidepane was removed (it was confusing). Enabling/Disabling the different plugins can now be done in the preferences. The UI was improved, in particular the alignments and the dotted separators on the left of the menu. The default hover delay was changed to 150ms. Various bugs were fixed: empty application list on first-run, mouse grab issue with package manager. 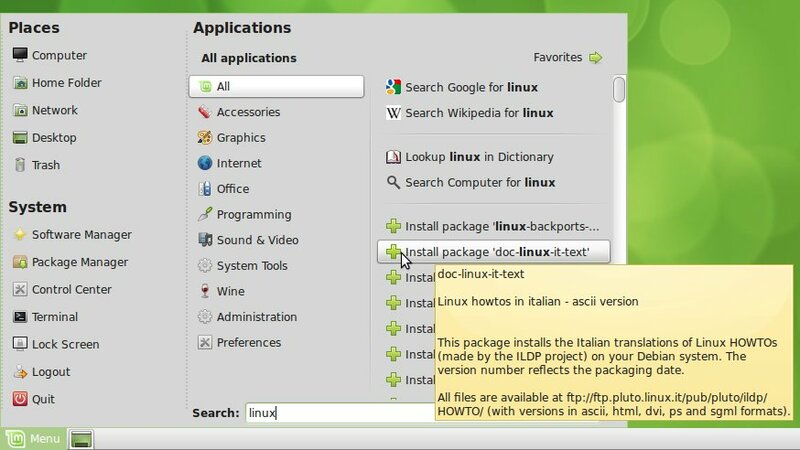 Previous Previous post: Linux Mint Debian (201009) released! Can i install it on my “ubuntu-ish” Gnome Mint9? Amado: Yes. With some minor exceptions, all our tools can be used as they are on both LMDE and Ubuntu-based editions of Mint. The reason it’s already in LMDE is because it’s a rolling distribution, so people don’t need to wait for Mint 10 to be released. The packages will stay in romeo until they’re fully translated though. The Julia repos aren’t ready yet. Upcoming Mint 10 features will be made available to LMDE-romeo and julia-main as they are developed. I’ve been using this since yesterday (Thanks Ikey), and its great, except for a slight lag while typing. Mint just keeps getting better and better. Wow! Pretty cool guys! I haven’t noticed it was there, but I love it! Great job from the mint team again! That is by far the best menu I’ve seen in any linux distros and it’s getting even better! Let me guess.. Green, gnome-colors, and several links to install things where they should be “out-of-box”. I want to see the new theme, something really neat, elegant. The only problem I would have this is that Google logs all of your searches and most of your browsing. That is why I use Start Page to search. I really don’t want the government to know what I search for. Looking quite nice! Not sure if I’ll use it but it’s nice to know that it’s there! These are the kind of features that make you smile instantly when you discover them and reaffirm your choice to use Mint. It’s user candy. These little things that make life just that bit easier and make you love the people that thought of them and took the time to create them. I can’t see the new features at all. I’m on LMDE with Romeo enabled. I checked that I have mintmenu 5.0.4 installed. But all I see is the old filter box. What I’m missing here? @WoodCAT: For me it required a complete restart. Thanks, that did it. 🙂 Works as advertised! Another great feature in Mint. Well, i only want the search bar to do two things. Search for programs which it does. And secondly if i know the exact name of the program, to type it into the search bar and hit enter to run it. Installing packages from the menu really deviates from the job and purpose of a menu. After all, this is why we have software manager for noobs, synaptic for more advanced users, and apt via cli for more advanced users too. We already have three ways of doing the same thing. Why do we need a fourth? Lastly, searching through a search engine is cool and all, but ideally everyone just opens up a web browser in order to do this. I also feel this deviates from the purpose and job of the menu. Btw, i used the menu to write this up. But, i failed to realize that i could not use the menu to submit a comment here. Oh well, i figured it out i guess. I like a responsive menu, make the search results processing parallel, and have the search results display after the window has finished its first pass render. I’m also hoping that sooner or later, “Hardware Drivers” will be integrated as well in LMDE like it’s found on Ubuntu-based editions. For easy installation of non free nvidia drivers. Or is it possible to start from Ubuntu based, to get “Hardware Drivers” then install non free nvidia drivers, then update the repo same as the repo for LMDE? I just want to get the “Hardware Drivers” feature from the Ubuntu-based Mint and have it working on LMDE. I had actually thought I had lost my capacity for surprise. I was more than satisfied with ubuntu holding together my Mint system. Now I learn that, though sky high, my expectations were intrinsically low. GOOD DONE! THIS WILL BE A COOLER MINTY FUTURE! Salutations from the deep Paraguayan jungle! Awesome work. I love Linux Mint. I can’t thank you guys enough. If I ever get enough money, I’ll definitely donate to your project and for anyone reading this, the Linux Mint team definitely deserve donations for the hard work and effort if you have extra money to spare. I only wish my rooted android phone is as cool as Linux Mint. @windsor marketing – By what I understand, a hardware drivers module/app, jocky and such are going to be available at a later date. The hardware drivers app either has to be written from scratch or modified from an already existing app in order to work in LMDE. The current Hardware drivers app you find in the Main and Community editions of Linux Mint is the one ported over from Ubuntu which currently is not compatible “as is” with LMDE. A fine update to an already fine menu system. One odd bug I found so far is when I type a query into the Mint Menu’s search field and then click on the “little button” to the right of the field to bring up the menu, all focus is lost to the search field itself. From that point on the word or phrase in the search field is frozen and can’t be modified. The cursor disappears as well and does not reappear when clicking on the search field. Refreshing the menu by clicking on the Menu button in the panel twice brings things back to normal. Hi, I can say the I do like the new Menu. I installed to test it out. Only thing is that when using the search box the typing lags. I am using Linux Mint 9 MAIN EDITION if that helps. The older menu did not lag when typing in the search box. Some of the tools have still Ubuntu branding or text in them. One example is on Preferences – mintUpdate which makes me confused whether they’re still using Ubuntu repo or not. You guys never cease to deliver. This is yet another feature in an already packed distro that really proves the “desktop OS” possibility of a linux version. Excellent work. I will continue to spread the word about Mint. Sorry for the 2nd post, but I would also Like to be able to change the search engine. I know that some do not like to use google. Thank you. When I type something in and it loads, it seems to take quite a while to search, especially if you’ve typed something in wrong and you’re trying to press backspace, it does hang for a bit. Good work! I’ll be looking forward to the new version of Mint. Only a little note from experience: some elderly people I know that run Linux Mint were very frustrated that their start menu somehow “doesn’t show any programs”. I didn’t quite believe them on the phone; but after a while I found out that all they did is unpurposely click on the “Applications” headline at some point of time… I realized that it is a COMPLETELY unexpected behaviour to have a window disappear when clicking on its headline. They never realized that the little icons on the left were there to get back the applications tab and they were shouting at that “damn linux”. Solution: just make loosing the applications tab harder by putting the option to the options dialog. Really, nobody needs to change that visibility every day on a one-click-base. It is a bad trap for inexperienced users. I agree with shamil. This adds clutter to an already cluttered menu. A menu’s function should not be to suggest programs to install. Synaptic works fine for me. A it is I already remove the menu in favor of Gnomenu. I love mint, but this “feature” is just useless. It’s been said before, we have 3 ways to install packages, do we really need a 4th? Why is the start menu trying to do everything? Use a web browser to search on google. Use software manager, synaptic, or apt via cli to install packages. Why does the start menu need to do this? The only logical progression of these two features would be to uninstall packages via the menu, and to actually surf the web inside the menu. Is this blog post supposed to be a joke? I think this is a fantastic feature, keep up the innovative work. Also look forward to a stable Debian based release. 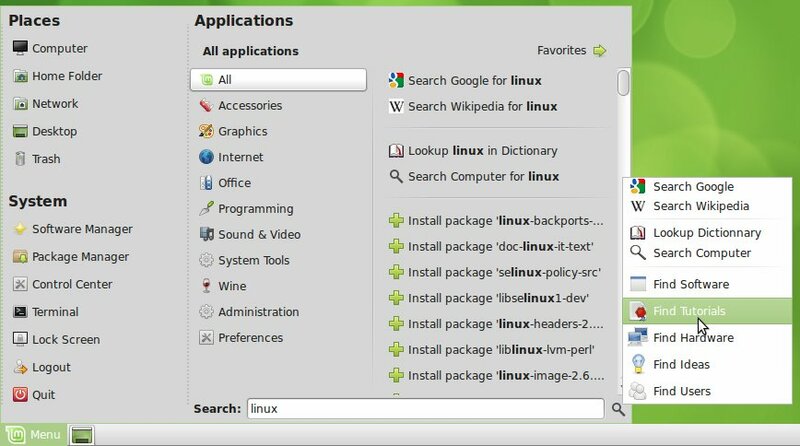 Linux Mint is becoming too bleeding edge in my opinion and the focus should be on stability and beautifying the desktop rather than trying to keep up with the Jones’. There’s only so much tweaking and bug chasing one can deal with before they pick up and search for the next distro. Is it possible to switch to SSL-Service from Google (as default)? Or can I change that by my one, when the new menu is istalled? Well, good it does uninstall software i guess. So far, this is a great move for a bloated menu. Instead of this menu thing getting out of hand, a plugin system for menu addon’s would be much better. An install/uninstall package plugin, and a search the web plugin would be much more ideal than making these built in features that no one can do anything about. After that i can see menu plugins getting popular. shamil: It’s already using plugins… not to mention that these features come up on demand, so if you don’t use them, the menu still works the way it did before. Search sounds interesting. I hope it will be easy to customize to use a different engine than Google. Some of us find its privacy record distasteful. Just wondering, why aren’t my comments appearing? @Verix: Nevermind, I’ve been trying for 3 days with no luck. I’m just wishing the menu would also incorporate dynamic file browsing when the keyword starts with ‘/’ or a ‘~’, akin to how the start menu search works in Vista and Windows 7. Would be a really useful feature, to me at least. I really love the menu and believe it’s Mint’s most defining and distinguishing asset. These additional features make it all the more addictive and intuitive. Kudos for the great vision and awesome work guys. i used to have 2 additional settings to defaults , always to use recent docs with a sidepane, and i always deleted the text , so i used only linuxmint icon. necromantiarian: Thanks for the quick feedback. A fix is coming your way (version 5.0.7). can you kindly advise what I am doing wrong please? Awesome! As long as it happens fast, and we can switch google to something more privacy friendly, this is a great feature!! I’m installing LMDE right now on an extra partition to try this and several other new features out… 🙂 I’ll be harassing you on the forums with feedback in no time…. But extra features i don’t use take up memory. Cool with the plugins though, i think i can work with that. shamil: Memory usage was the first thing I looked at when deciding whether we were going to integrate APT into the menu. It’s basically an array of 30,000 items loaded into memory, so there is an extra bit of resources used but compared to the overall picture of what’s already taken by mintMenu, it wasn’t significant. I doubt people will see any impact on their system. If they do, we’ll add an option to turn this feature off, but I don’t think it will come to that. Hi Clem, I think this is a great idea and will use it. For me however Linux is about choice and the ability to switch on/off or change things is key. Choice is always good to have but I tested this new mintmenu feature on an old machine (k, connection speed is not too bad tho) and it really works great! However, still speaking of choice, what keeps me from using mintmenu is the possibility of themeing – or does it already exist? No offense intended, but – despite these great features – to me the menu just doesn’t look too good 😎 other than this really minor (personal flavor kinda) thing, really a good menu! following your reasoning about the harassed Non-Facebookuser, for a Non-Googlesearcher its quite the same. Nice one! Very cool enhancements. Everything works fine here. Resident size only increased by about one meg. The menu is very responsive, seems quite solid so far and without any noticeable lags anywhere. You guys do really nice work! Great! I have mint running on my laptop. The atheros drivers are there and I don’t have to manually build them. It’s more light than ubuntu as you mentioned. Clem, very innovative and quite handy!!! @shamill: If you don’t like the mintMenu you can always right click on the panel and add the default gnome-menu to it. But please don’t complain that those of us who love the new menu are getting what we want. For us, the menu is more of a starting point to do things. We don’t want to have to first start up a web browser to then search when we could type our query into the search bar of the menu and have it fire up a web browser with the results to the query. It’s also quite nice to have the apt search in the menu cause we may think that we have an application on that computer only to find that we don’t, but there’s a link right there to download and install it. You don’t have to like it, and you can have your mint without it if you don’t like it. -PulseAudio is something we are forced to accept, although we can purge it, yet it requires time and experience. Somedays I wonder if Linux is still about the free choice. Please add an option to turn off this search engine for installation. That will help people to decide whether to use that or not. But don’t impose anything. One more thing: I usually use around 15 bookmarks, and I hate lateral submenus, so if it is possible don’t limit the number of places added to that list (which is around 11 in Lucid, or so). I hope I could persuade you, Clem! Interesting, especially with regard to installing packages via type-to-search. I’ll probably stick to using a browser to initiate searches or look up articles on Wikipedia, though. I would like to echo other commenters’ sentiments in that whenever such a structural enhancement is added to mintMenu, please include an option in the configuration dialog to turn it off. and editing the configuration manually. @Lumenary: You’ve been able to do that for at least 2 or 3 versions now. You still on Daryna or something? Has anyone tried this in Mint 9 KDE yet? Or will it only work in Mint Editions using Gnome?